The first Thanksgiving feast took place in 1621 as a way to give thanks to the Native Americans for helping the Pilgrims of Plymouth Colony survive their first winter in New England. The first Thanksgiving celebration lasted three days, but today it is a one-day celebration, observed every year on the fourth Thursday in November. 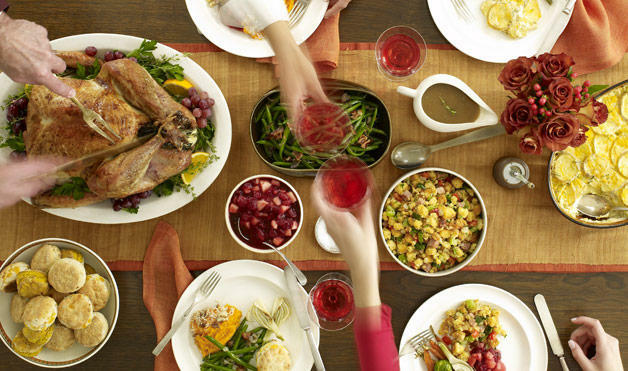 The day is traditionally marked by gathering with friends and family to give thanks (and to enjoy a delicious meal)! Read on for the top ten Thanksgiving dishes that are likely to be found on the table at this yearly feast. 1. Turkey: This is the star of any Thanksgiving meal – sometimes the holiday is even referred to as "Turkey Day." 2. Mashed potatoes: It's hard to imagine a Thanksgiving meal without this staple. Don't forget to add the gravy! 3. Stuffing: Bread crumbs, onion, celery and a variety of spices make this dish complete. It's traditionally cooked inside the turkey. 4. Gravy: There's nothing like delicious homemade gravy drizzled on turkey and mashed potatoes. The best gravy is made from the turkey drippings left in the pan. 5. Cranberry sauce: Whether it comes in a can or is homemade – a Thanksgiving meal just isn't complete without cranberry sauce. 7. Rolls: A staple on any table, rolls are perfect for mopping up leftovers on your plate or making sandwiches out of all the leftover turkey. 8. Sweet potatoes: Sweet potatoes and yams make a decadent dish. There are many variations, but sweet potato casserole is a crowd pleaser — potatoes are mixed with butter and brown sugar and topped with melted marshmallows for an extra sweet treat! 9. Green bean casserole: Typically baked with cream of mushroom soup and topped with crunchy fried onions, this simple side dish is a delicious American classic. 10. Corn: Most historical experts agree that this vegetable was part of the first Thanksgiving feast and it is a tradition that has carried on.